Alas, Lill Lindfors remains best known outside Sweden for her wardrobe malfunction" in the 1985 Eurovision song contest, actually a well-handled publicity stunt. She's actually a remarkably good vocalist and a dynamic performer, worth far more than that annual dose of television schlock. 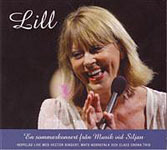 Lindfors is not known for singing jazz but does it extremely well.